Planning to major in Spanish? Explore our Lowry Ambassador Scholarship to support the study abroad experience requirement. Wouldn't it be exciting to perfect your Spanish skills learning from a professor who ran with the bulls at the Sanfermines festival in Pamplona, Spain, or another who completed the entire pilgrimage Camino de Santiago? With Spanish being the second most common language spoken in the US and more than 400 million speaking Spanish world-wide, this major is a smart choice for students thinking about business, social services or education. Some say traveling is the best way to learn a foreign language. Through travel you gain confidence in your conversational skills, explore interesting sights, learn about culture, and meet new friends. At Lycoming, even before you step foot in Spanish speaking America or overseas at our affiliates in Ecuador and Spain, we'll have you traveling through our coursework, international programming, and lively conversation tables with our native speakers. For a list of Spanish courses, please see our Course Catalog. The festival is called San Fermín after the Patron Saint of that area of Spain. 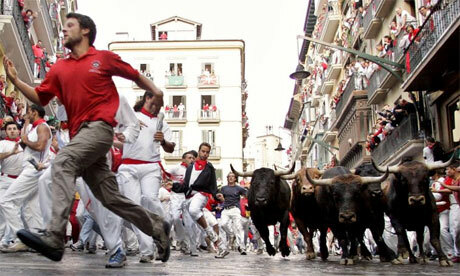 It takes place in Pamplona, Spain, for eight days every year in July. Every morning, people run through the city streets with six bulls. The course is about a half of a mile long and ends in the bullring. Every evening, there’s a bullfight with the bulls from that day. The next morning, there are six new bulls running through the streets. Hemingway wrote about this particular festival in The Sun Also Rises. It’s dangerous; you can get gored or trampled, but our very own Dr. Sandra Kingery did just fine. "The Way of St. James" – St. James, one of the 12 apostles, was a fisherman who is said to have preached from the Mediterranean to Spain after Jesus's death and resurrection. He was eventually beheaded by King Herod. Rumor has it that believers secretly carried his body back to Spain and buried it near the northern coast (what is now the town of Santiago de Compostela). When it was rediscovered, people from all across Europe made the trip to pray at St. James’ gravesite. Today, it's one of the most famous pilgrimages! Cuenca is Ecuador's third largest city and is known as the cultural capital! The landscape here is tough to beat. In addition to exploring the surroundings, there are two universities, museums, art galleries and even Indian Markets, which give you the chance to fully explore the culture like a local. Madrid is home to the Salamanca district, which is a busy area filled with shopping, restaurants, bars, tapas bars and much more! Outside of this district, you’ll find just as many museums, theatres, cinemas and concerts. You’re literally in the middle of Spain, so you can take advantage of excursions to Toledo, Segovia and Avila. Looking for more? Visit our study abroad page for more information.